What is “Soul”? Soul is the immortal essence of life. It is the electrochemical element that binds the “self” to the “all”. What does Soul sound like? Soul is a deep resonance in your chest that sparks emotion, sets your heart on fire and makes you move. 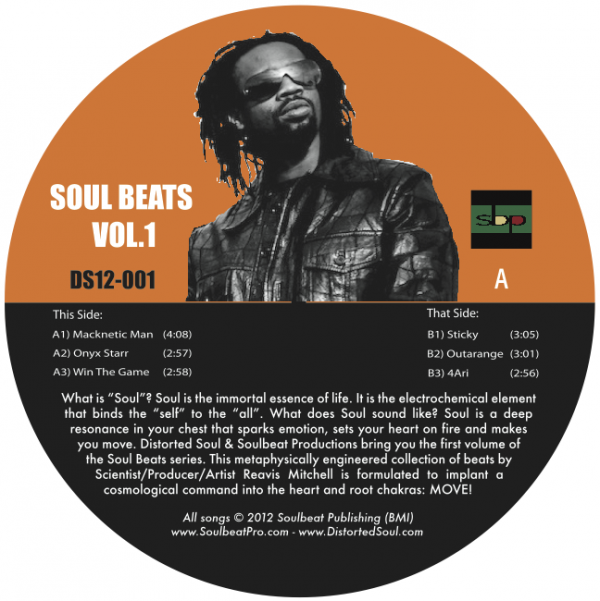 Distorted Soul & Soulbeat Productions bring you the first volume of the Soul Beats series, as scientist/producer/artist Reavis Mitchell breaks the sound barrier again. Though he recently came to prominence as a co-founder of BKE Technology and an architect of the Beat Thang Mobile Music Production System, Rev has been manufacturing music for years. Clients like Sony Music, Coca-Cola, McDonald’s, USA Networks and a bevy of major label and independent artists rely on Professor Mitchell’s Soulbeat Productions to power their products to new heights. On Soul Beats Volume 1, the Soulbeat Scientist has concocted a collection of signature soul-infused hip hop and funk instrumentals for your sonic toolbox.